The Kilmarnock boss suggested Jermain Defoe should be charged and banned for diving. 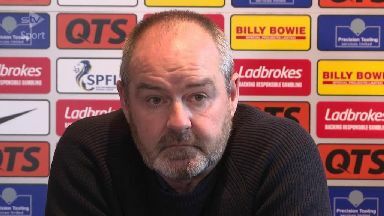 Kilmarnock manager Steve Clarke has once again called for consistency in refereeing and the disciplinary process after a weekend of controversy. Clarke said he saw a lack of uniformity in decision making and believes a diving incident from Rangers' 4-0 win over St Mirren should be subject to retrospective punishment. Rangers were awarded four penalties in the match with many observers saying Jermain Defoe had thrown himself down to win his side their second spot kick. Clarke said referee Andrew Dallas got the big calls wrong at Ibrox and said in his own game on Friday night there was a mistake where an assistant referee got an offside call wrong by a remarkable margin. "You sit here on a Monday after a weekend where everyone talks about referees," he said. "Consistency of refereeing. One player runs to the crowd yesterday to celebrate a goal and gets a yellow card. One player runs to the crowd to celebrate a goal and doesn't get a yellow card. "Has he been pulled up about it? Has he been shown it? Has he been told that it was wrong? Probably not. He probably doesn't even know it's a mistake. "It has to be sorted." Clarke has been vocal before about the standard of officials and the disciplinary process, receiving a notice of complaint for his comments in the past. Asked how he felt about the continuing controversy, he admitted to being fed up with seeing inconsistency. He alluded to Defoe's penalty again and suggested the player should get the same punishment as Jordan Jones did earlier in the season. Clarke said: "[Exasperated is] a good word. I think I find myself increasingly disappointed.